Windows provides different system management modes like interactive and batch. Batch management mode is used like running scripts without or little user interaction. We can use ASSOC command in order to find a file type and detailed explanation with this command. We will provide the extension like .txt into the ASSOC command like below. 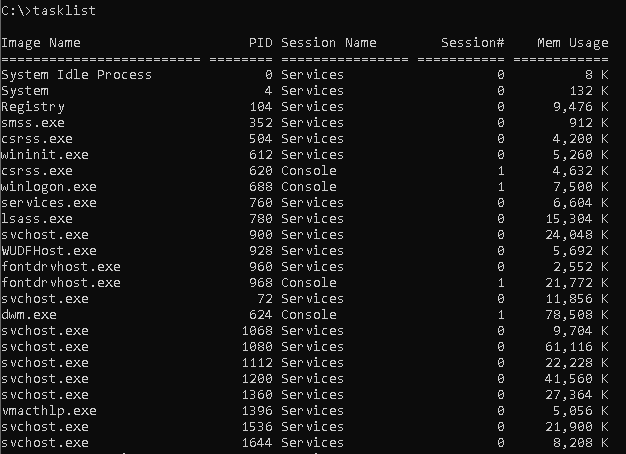 As we can see from output that .exe extension is associated with executable file . If we do not provide a parameter ASSOC will list all existing associations with related extensions. ATTRIB command is used to list, display and change file attributes about files, folders and directories. We can list given file or folder attributes like below. We can change the file attribute to read only which will made given file uneditable. If we want to make to hidden the file we will use +ah option. This will made file hidden from regular user files and folders. After setting some attributed we can remote these attributes later. We will use - sign to remove specified attribute. In this example we will remove read only attribute with the -r option like below. CD will provide very useful feature where we can change given working directory. We can also provide multi level paths to change. We will start by changing given child directory. We will first use DIR to list directories. We can use .. as specify parent directory. We can go upper level directory or parent directory with the following command. We can also change the current partition. We will change to the drive :d in this example. CHKDSK command can be used to check and repair disk and file systems. We can simply use it like below. If we need to get input from the user with provided choice we can use CHOICE command like below. We will provide Yes or No like below. ECHO You want tea? CHOISE /c YN /m "Yes or No"
CHOISE /c YN /m "Yes or No"
After some work and operation there will be a lot of option on the console or screen. We can clean this console or screen with the CLS command. 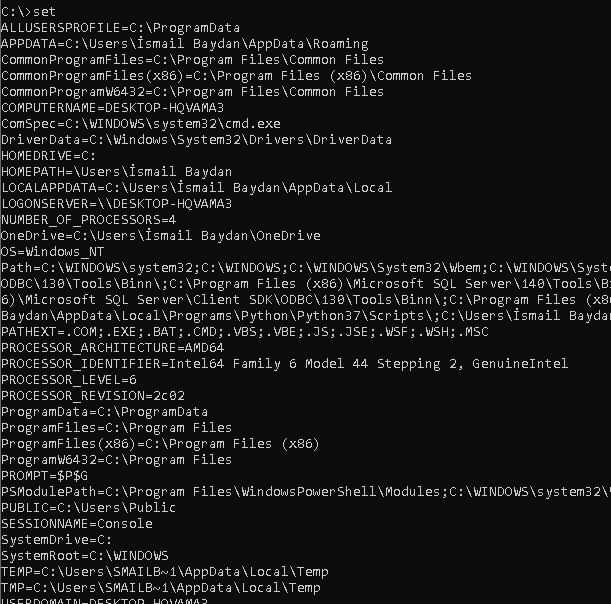 If we want to create new or child command prompt we can use CMD which will call cmd.exe application. This is a bit low level command where we can convert file system of the given partition. In this example we will convert partition D: . We can copy given file to the destination with the COPY command. In this example we will copy file a.txt to the D: partition. We can use %DATE% variable which holds the current date. We will print to the console with the echo command. We can delete files with the DEL command. We will provide the name of the file we want to delete. We can also delete for specific extension. For example we can delete text files those generally have .txt extension with the following command. If we will delete in bulk confirmation will help us. We can use /p option which will enable confirmation before each file deletion. 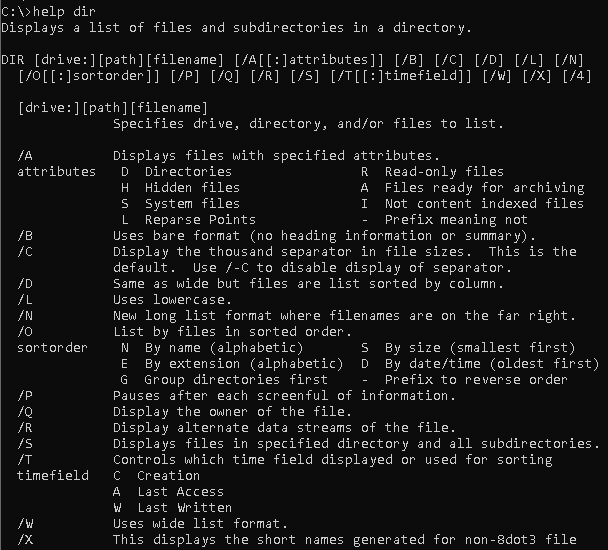 We can list current working and given directory files and folders with the DIR command like below. By default hidden files and folders do not listed. But we can list hidden files and folders with the /ah option like below. We can use DISKPART command in order to list, display and change disk partition properties. 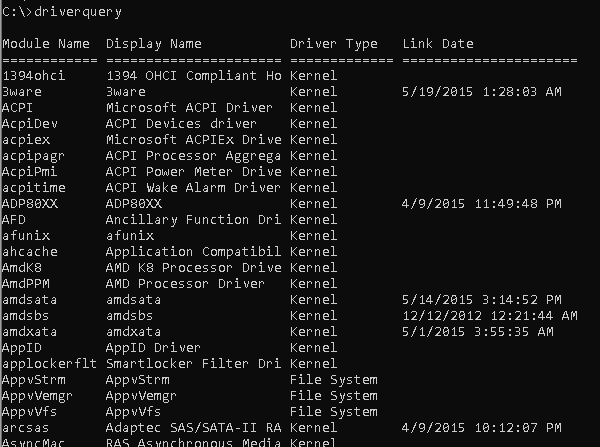 We can use DRIVERQUERY in order to list installed device drivers and related properties with dates. ECHO command is used to print to the console or standard output. We can also use this command in order to print environment variables or given strings. We will print given string which is "Hello World" in this case. We can use EXIT in order to terminate current console and exit. This will also end current script too. We can compare two files and print differencies with the FC command. We will provide two files named a.txt and b.txt in this example. We can use FIND command to search for given string in a given file. In this example we will search for test in file named a.txt. Another command to change File System is FORMAT command. We will also provide the partition we want to format. While using batch commands we may need to get help for general or specific command. 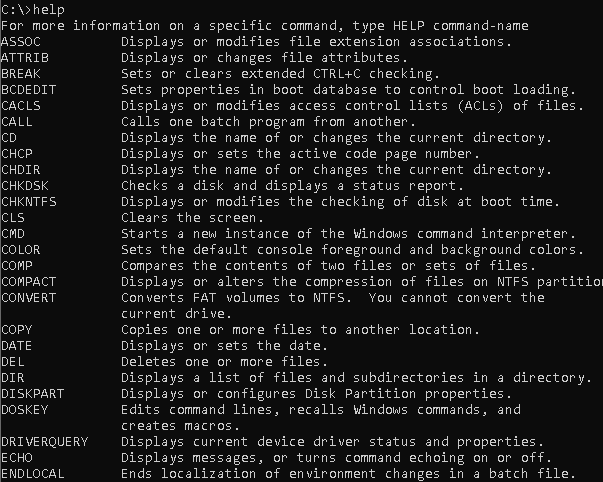 We can use HELP command which will display available commands provided by MSDOS. Without any option we can list all commands provided by MSDOS with HELP command like below. 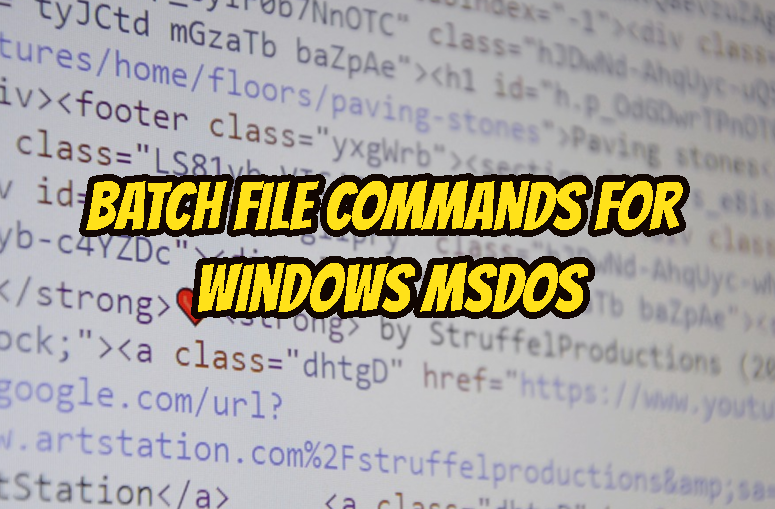 We can get detailed information about a MSDOS command by providing the command after HELP. In this example we will list information about DIR command. 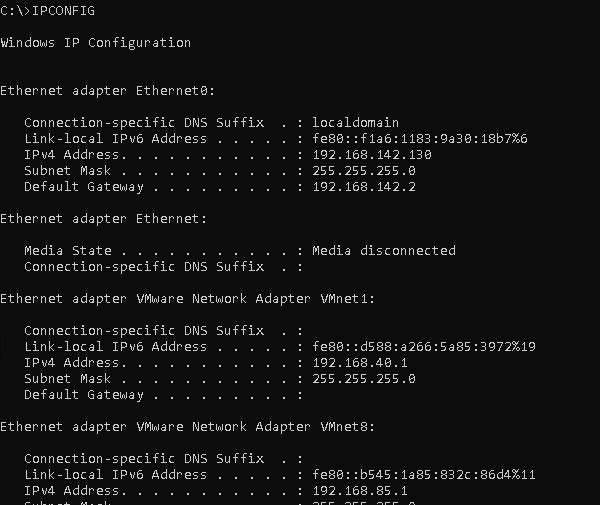 IPCONFIG will list information about the current system network interfaces and IP configuration. Disks are labeled for easy of management. We can use LABEL command in order to change or remove disk labels. We can use MD command in order to create new directory or folder. In this example we will create a folder named BACKUP. We can read a file content with the MORE command. Especially text files can be printed from command line. We will also provide the file name to this command. We can use MOVE command in order to move files and folders. This command can be also used to rename files and folders. Windows operating system provides a lot of network related options for their operating system and services. We can use NET command with the following features. PATH variable provides commands and applications to run. We can list these paths with the PATH variable. If we want to stop a script output we can use PAUSE command. This will stop script up to pressing a key for the console. PING command can be used to test remote system connectivity. We will also provide the IP address or host name of the remote system. It will send 4 time and ICMP package for test. We can use RD command in order to remove empty directory. This will not work for non-empty directories. We will remove directory named ABC. We may need to put some comments about the script file. We will use REM in order to add comments. All lines starting with the REM will interpreted as comment. We can list current environment variables with the SET command. We can shutdown the system with the SHUTDOWN command like below. We can use SYSTEMINFO in order to list and display computer, operating system and software information. We can list currently running tasks and processes with the TASKLIST command. We can use TIME command in order to display or set current time of the system. We will use %TIME% variable like below. 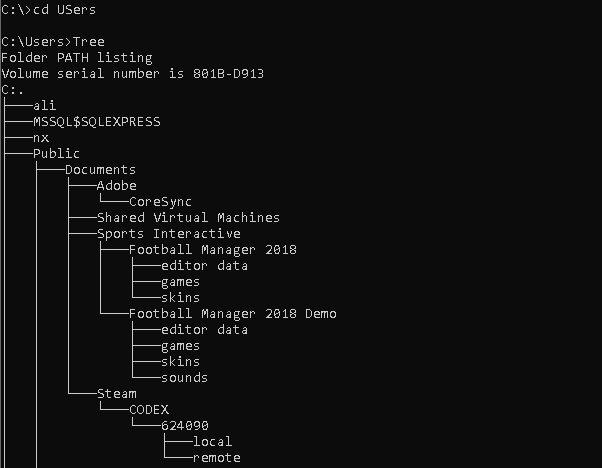 We can list current directory child or subdirectories with the TREE command. It will provide very useful output for investigating folder hierarchy. Windows operating systems and MSDOS have different versions. 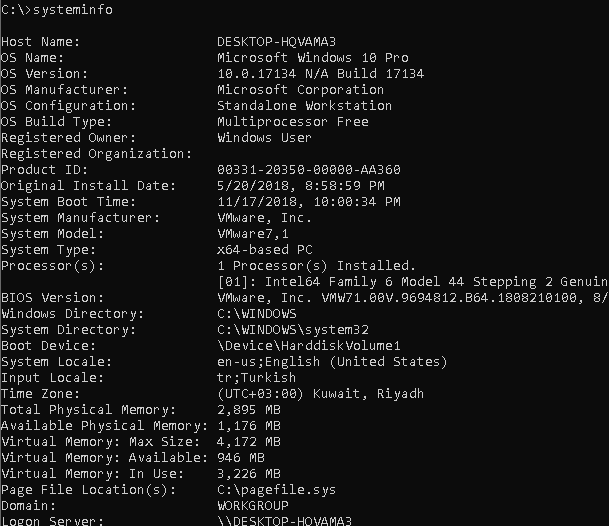 We can display current operating system and MSDOS version with the VERcommand like below. We can displat current volume label with the VOL command.